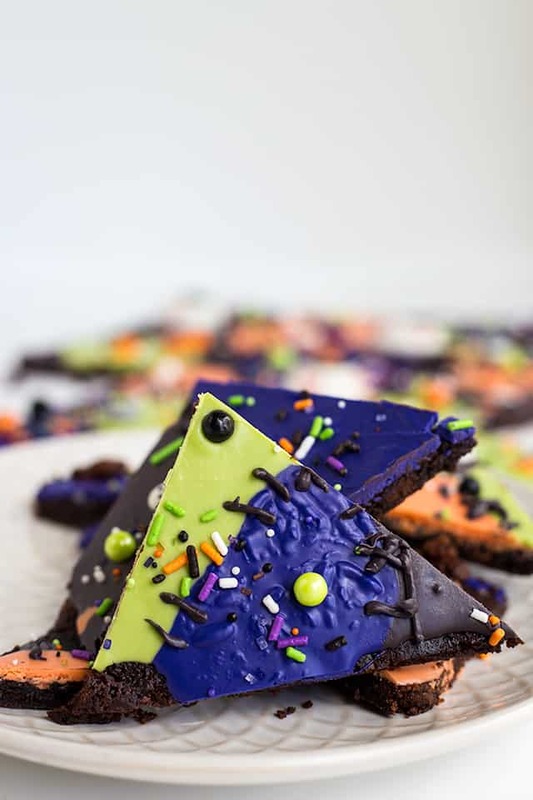 This is such an easy Halloween treat to make and it takes no time at all! 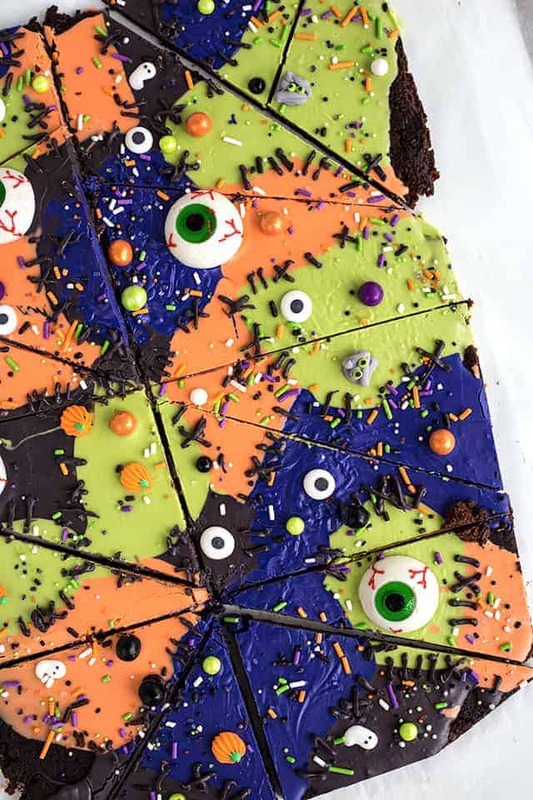 This monster mashup brownie bark has a brownie baked and rolled out, candy melts poured all over it, and topped with some adorable monster mashup sprinkles! 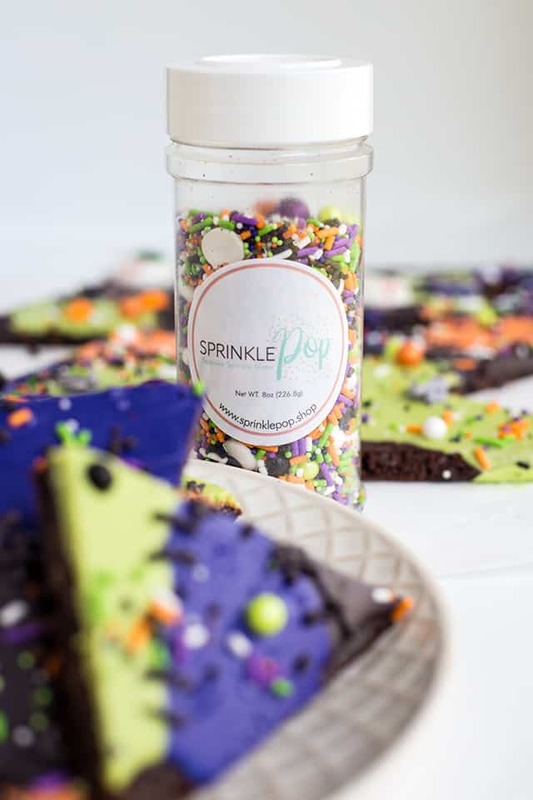 Sprinkle Pop has sponsored me for this #choctoberfest post. All opinions are my own. Remember to enter the giveaway over here. When I set my eyes on these Monster Mashup Sprinkles, I knew I had to have them in the biggest jar I could get. The pumpkins are my favorite in the mix. I almost think I can make those on my own which I might be trying to do if I ever have any free time. I made each color of candy melt into a “monster”. I added spoonfuls of each color all over and then tapped the brownies on the counter until they all spread out and touched each other. You can also place a piece of wax paper on top of the candy melts and press them all together. This works great if your candy melts are too thick to spread out by tapping. The only issue I found with this is that the colors bleed together a lot more than when you just tap them which makes it hard to give them stitches. I used a boxed brownie mix for my brownie but your favorite brownie recipe will work! All of my brownie recipes are made in an 8×8 pan and I’ve never doubled them to try to make a 9×13 pan so it was just easier for me to use a box. Side note, I have written down on my to-do list to focus on more brownie recipes after the holidays. I recommend covering the baking pan with tin foil and coating with a cooking spray that has flour in it. It’s much easier to get it out of the pan and off the tin foil to roll out without breaking into pieces. The next step after the brownies have cooled is to roll them out. Pull them out of the pan and turn them over onto a piece of wax paper or parchment paper. Pull off the foil and add another piece of wax paper/parchment paper. Roll out. Now it’s time to work your magic on those candy melts. You can leave them, but I thinned each color out with 1 1/2 to 2 teaspoons of refined coconut oil. Basically, you want it to be a pourable consistency. If it just plops off the spoon, add a little more coconut oil and stir. 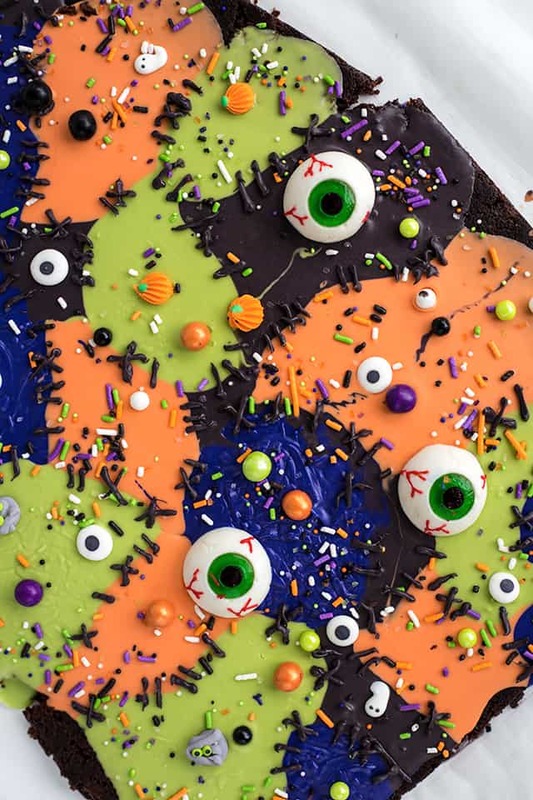 After you’ve added the candy melts all over the place and tapped them on the counter, start adding your Monster Mashup Sprinkles. I poured mine into a bowl and placed the big cute ones on first to make sure they were facing up and then just sprinkled the rest on. Kids love to add the sprinkles. I had some giant gummy eyeballs left over from my purple people eater drink so I added those too. Perfect for monster eyes. Lastly, I heated up some extra black candy melts with a little less coconut oil added and piped stitches onto the different colors. 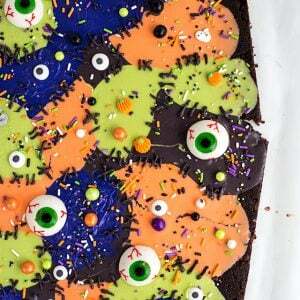 It just added a little something extra Halloweenie to the monster mashup brownie bark. Make sure to line your baking pan with tin foil and use cooking spray with flour on it for an easier release. Roll the brownies out on wax paper/parchment paper with a cookie sheet underneath to make it easy to move. Thin the candy melts out to a pourable consistency with refined coconut oil. The refined coconut oil has a neutral scent and flavor. I found that melting the candy melts first and then adding the refined coconut oil afterward seems to think the candy melts thinned. I used a brownie box mix with chocolate chips in it. 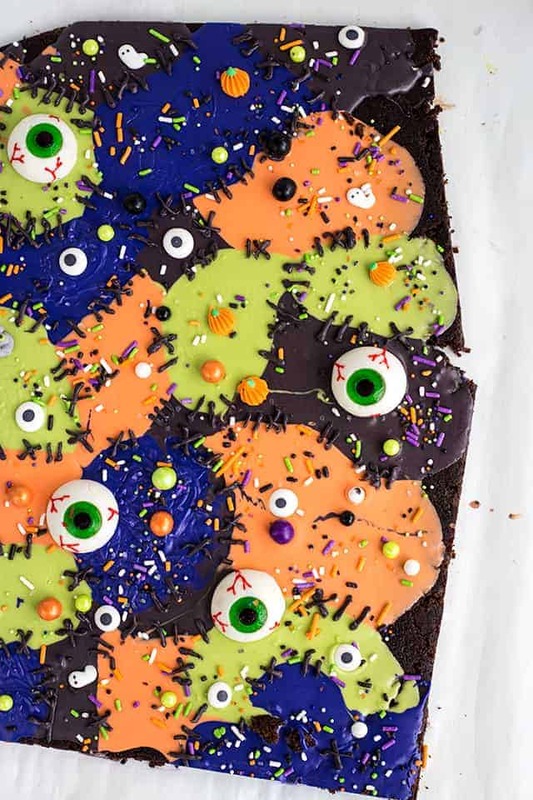 This monster mashup brownie bark has a brownie baked and rolled out, candy melts poured all over it, and topped with some adorable monster mashup sprinkles! Preheat oven to 350 degrees. Line a 9x13 pan with tin foil. Spray with nonstick cooking spray with flour. Place the brownie batter into the prepared pan and bake for the recommended time. Pull the brownies out of the pan by lifting on the tin foil. Turn out onto a piece of wax paper or parchment paper that's on top of a cookie sheet. This will help move it. Remove foil and replace with a piece of wax paper or parchment paper. Roll between 1/4 and 1/2 of an inch. Melt 1/2 cup of each candy melts in individual microwave-safe bowls in 30-second increments. Stir after each increment in the microwave. Once all the lumps are gone, add in the coconut oil starting at 1 1/2 teaspoons. Add 1/2 teaspoon more of the coconut oil if the candy melts don't flow off the spoon but instead just plops off. 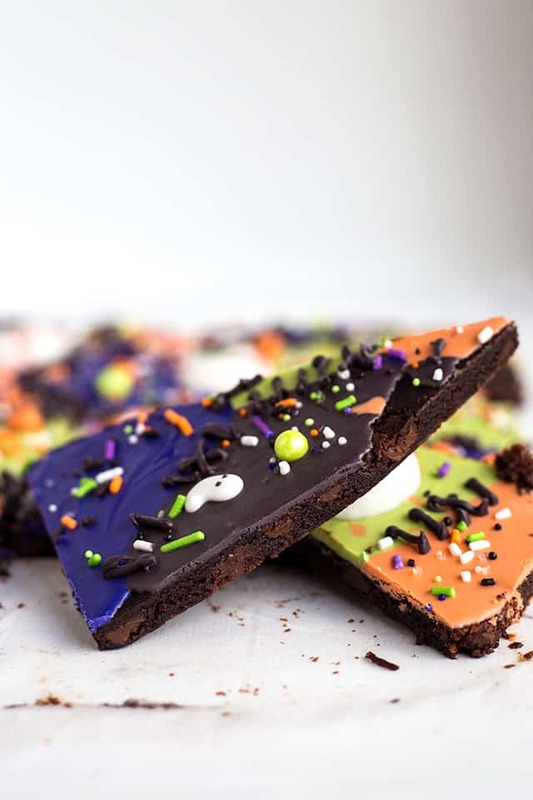 Add the different colors of candy melts in spoonfuls all over the brownie bark. Tap on the counter to spread the candy melts all over. Start adding the gummy eyes and sprinkles to the top of the candy melts. I placed mine in a bowl and placed the cute pumpkins, ghosts, mummies, and eyes on to make sure they were facing up and then just sprinkled the rest all over. In the same bowl you used for the first black candy melts, heat up the remaining 1/4 cup of black candy melts in 30-second increments. Stir after each increment. Once smooth, add in 1/2 teaspoon of coconut oil and stir to combine. Add into a sandwich bag and cut a small hole in one of the corners. Begin piping stitches on any of the spots where two colors come together. I piped frosting over top of sprinkles too. Let the candy melts harden. Cut and serve the brownie bark! If you find that the candy melts are too thick to spread out by tapping once they've been added to the brownie, use a piece of wax paper and spread the candy melts out that way. It will blend the colors of candy melts though. 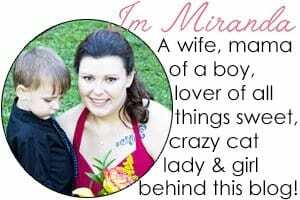 I love, love, love this! What a fun spin on an already delicious treat 😋 Plus, I love anything that promotes adding more colour!